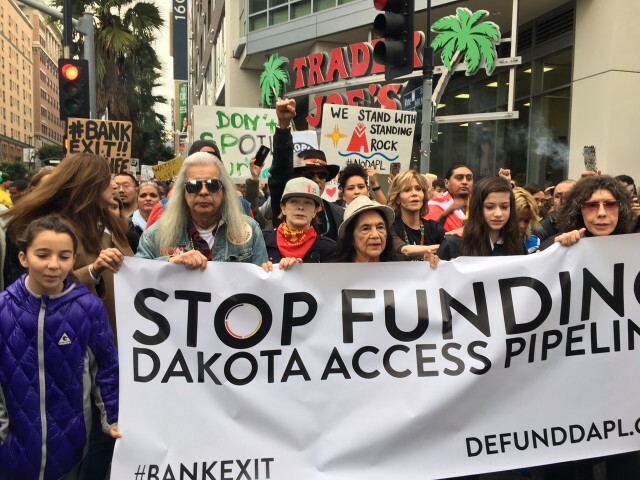 On my 79th birthday, Winter Solstice, I participated in a big action in Hollywood with many Indigenous leaders, friends, family and celebs to call attention to the #DefundDAPL movement, suggesting that people pull their money out of banks that have loaned to the North Dakota Pipeline. I withdrew money from Wells Fargo and sent the letter below to Tim Sloan, CEO of Wells Fargo. You can see Lily Tomlin on the far right, Catherine Keener on the far left, Frances Fisher, Delores Huerta and Viva Vadim, my granddaughter in the middle. I’m a little behind. As a customer of your bank, I reject the notion of my money helping to support your investment in the Dakota Access Pipeline (DAPL), an inherently dangerous and unjust oil pipeline that threatens air and water quality in many states and violates sacred lands of the Standing Rock Sioux Tribe. The fact that Wells Fargo has invested money in DAPL indicates corporate irresponsibility and hypocrisy. As a signatory to the Equator Principles, how can Wells Fargo be associated with these companies? Even minimal due diligence shows that Energy Transfer Partners and Sonoco, the companies that own and operate the pipeline, have the worst oil spill records in the United States. How can I trust a bank that was not aware of this or the National Lawyers Guild’s list of lawsuits against ETP for contaminating groundwater in the states of New Jersey, Vermont, Pennsylvania, the Commonwealth of Puerto Rico and the City of Breau Bridge Louisiana; in addition to citations for releases of hazardous materials in Ohio, Oklahoma, Louisiana, Missouri Texas, Pennsylvania and Hawaii? DAPL already crosses a vast stretch of land and is asking to dig beneath the Missouri River. Yet, shockingly, despite its horrific record of contaminations, DAPL has not been required to do a full Environmental Impact Statement. And why is your bank sinking so much money into maximizing the amounts of oil and gas that can be brought to the surface and burned at a time when climate science is clear: we must maximize what we keep in the ground. Oil prices have dropped and production from the Bakken Fields has declined a stunning 25% from its peak in 2014. This means that, on top of everything else, DAPL is redundant –there is no economic rationale to increase the regional pipeline capacity. Harm to Native lands, culture and rights have already occurred. DAPL personnel deliberately desecrated documented burial grounds, committed gross violations of Indigenous Peoples rights; pose a major threat to the Tribes water source, and stands in violation of the international standards of Indigenous Peoples right to Free Prior Informed consent. 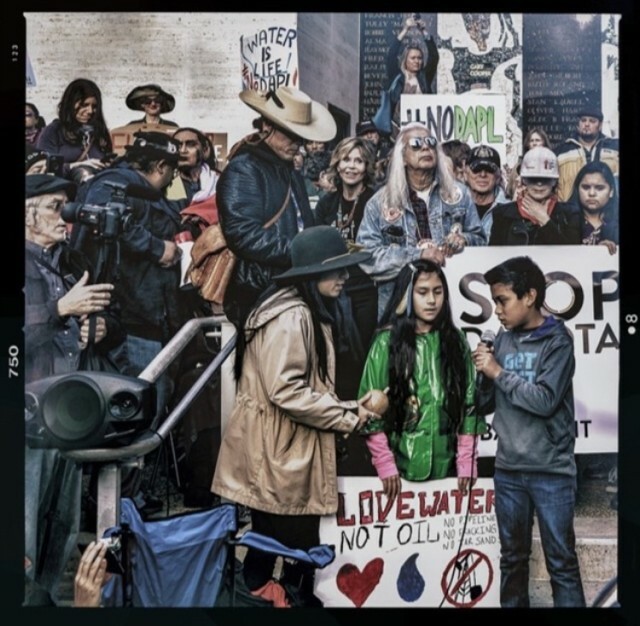 I ask that Wells Fargo withdraw its financial support of DAPL until a full scale environmental Impact Statement is completed and the outstanding issues with Standing Rock Sioux Tribe are resolved to the Tribe’s full satisfaction. Until then, I am withdrawing my money from your bank. This is awesome! Such a positive example of activism and making your voice count!! I watched the live streaming provided by many of the atendees and was so moved by your power and the power of the people. I watched it from the room of my house, far away in Portugal, but with my heart and soul with you all, and the noble causes you fight for. You are, were always and always will be an inspiration Jane, i look up to you with the utmost admiration and respect. You are a lider and a warrior and i am proud to be your follower. Merry Xmas dear Jane, Happy 2017, full of hope, health, peace and joy. I couldn’t resist to be there, out of support for the Standing Rock but also because you are an amazing woman and huge inspiration ! AND because it was your B-DAY! Glad I could join. I hope you had a great birthday and I wish you merry Christmas and a very happy new year with lots of happiness and success! 🙂 May you continue to inspire like you did here! Hugs! MOST IMPORTANT THING ON THIS EART “WATER”!!!!! HAPPY BIRTHDAY JANE ,,, NO FERRILESS RIDING THIS YEAR ! UH? What a great way to spend your 74th birthday, Jane! Congratulations! Did you ever hear back from Sloan? I wonder how many others have withdrawn money. The place to hit these businesses is in the pocketbook. But I wonder if they even care. Someone like you will probably get a response from Mr. Sloan because you are famous but what about the average citizens? The bank won’t shed a tear if other people close accounts. Great job of bringing this to our attention, but I can’t see them backing off. It’s like David vs. Golliath. What a perfect, purposeful way to spend your birthday. I am sure it was quite a sight to see on Sunset Blvd. with the dance. Wonderful! I canceled my credit card with one of the banks listed on the link you had posted and sent them a letter explaining why. I wanna wish you a happy, happy birthday!!! I love you so much omg!! 79 years young, you look incredible! Merry Christmas to you and your family also! I hope you had a fabulous day! Your family is super lucky to have you in their life! I hope you got to spend the day with them! Jane guess what!???! For Christmas, my best friend Lindsey, got me the best present ever this year, guess what is was… YOUR WORKOUT BOOK! I don’t really think I need to lose weight but just to stay in shape and get fit, also just because you made it and I know it helped so many people, I wanted the book so badly! Omg Jane I was so excited when I opened it!!! She knows I love you, she’s the one who actually told me to watch Grace and Frankie, I’m obsessed, I’ve watched both seasons 3 times and I will watch them again before season 3 comes out, which btw I’m so excited about! I also got some of your movies for xmas also, monster in law, 9 to 5, and my favorite- barefoot in the park! I just love it, I’m 17 and I came across a movie well before my time and I just wanna say I love it so much! Plus Robert Redford and you are just too cute to watch! I cannot contain my excitement for Our Souls At Night!!! It comes out 2017, but do you know a date or even a month?? January 1st would be nice haha!! You’re so pretty Jane, when I’m your age I hope I look half as good as you do!!!! I absolutely loved the dress you wore with the blue and pink flowers on it, you looked stunning!! My fav outfit recently-ish was in May when you wore that creamish white top with the emerald green pants, I loved that outfit so much and your hair! You seriously rock your look, and do not look 79 at alllll!! Also Jane, what you’re doing with your activism is so amazing. You truly are an inspiration to me. & I love that Lily was there with you, your partner in crime. Anyways Jane I just wanted to say I love you so much, you inspire me, I love the compassion and drive you have, I love your movies, I love Grace & Frankie and I know I’m going to love going through and reading your workout book!! Hello Jane Fonda. Happy Birthday, yours is truly a day to celebrate. You have brought so much good to the world, including politics from way back, entertainment (both French and American), exercise, and then all of those all over again, including really good comedy, and in this latest letter, reverence for the environment and respect for native cultures. Long sentence. The letter is just excellent. I’d been opposing the pipeline just because I support progressive causes, but I lacked a big picture. Your letter spells it out and with outstanding rhetorical finesse. Caroline from Madison, WI. .
Hopi means Peaceful People, and the truest and greatest power is the strength of peace. Because Peace is the Will of the Great Spirit. But do not think that just because the True Hopi People have been told by the Great Spirit never to take up arms that the True Hopi People will not fight, even die for what we know to be the right way of Life. The True Hopi People Know how to fight without killing or hurting. The True Hopi People Know how to fight with Truth and Positive Force In The Light Of the Great Spirit. The True Hopi People Know how to educate by clear thoughts, good pictures and by carefully chosen words. The True Hopi People Know how to show to all the world’s Children the True Way of Life by setting an example and by working and communicating in a way that reaches the minds and hearts of all people who are truly seeking the methods of a simple and spiritual Life which is the only Life that will survive. https://happynewyear2017.wiki/wp-content/uploads/2016/10/Happy-New-Year-2017-GIF-Images-for-Facebook-1.gif FOR YOU AND YOUR FAMILY ! FROM BRAZIL ! Ms. Jane, the people in front of Citibank told me you actually went to Wells Fargo and they refused to let you in. Is this true? If so, I’d like to write about this for American News X. Hoping you live to be 100+. You are an inspiration to us all. Thank you for all your efforts on behalf of mother earth and its inhabitants. I closed both my business and personal accounts with Chase. If they want to fund Sunoco well they will do so without my dollars. I am also moving my 4 IRA’s to the credit union. I am tired of these banks thinking there is no retribution for their actions. Well we can respond, by closing our accounts and using credit unions or small banks. Heather, we’re shooting season 4 right now!!! Jane is such an inspiration to millions of people and brings happiness. I have multiple sclerosis and some times felt like giving up. Was depressed but started watching the new show Netflix season 3 and it has cheered me up. I love the show. I’ve seen most of Jane’s interviews and she always says something valuable for everyone or something funny. A wonderful woman. Love you Jane. THE BLOSSOM OF YOUR YOUTHFUL AGE! Have you seen THIS?!? Thought I’d send it to you to make sure you catch it. It’s a hoot and it’s brilliant. I started recently to follow your blog and this post attracted my attention because today is my mum birthday. She would be 81 years old and she died Nov 17th last year. I believe I’ve found a role model.. In this moment of my life where I was wondering what is next for me, I believe the reply for me is “take the courage to be yourself” .. it is never too late! !